My walking buddy still has lovely roses blooming in November. Oh my so beautiful! Lovely soft color and lighting. Just a lovely shot.. So delicate..
Obviously you haven't had freezing weather yet! The coloration is beautiful! Beautiful colors and I really like your processing. Love what you've done with these. Beautiful. I'm impressed. All we have are mums! And it's a beautiful composition with your choice of soft color tones. Beautiful capture and edit -- great presentation ! 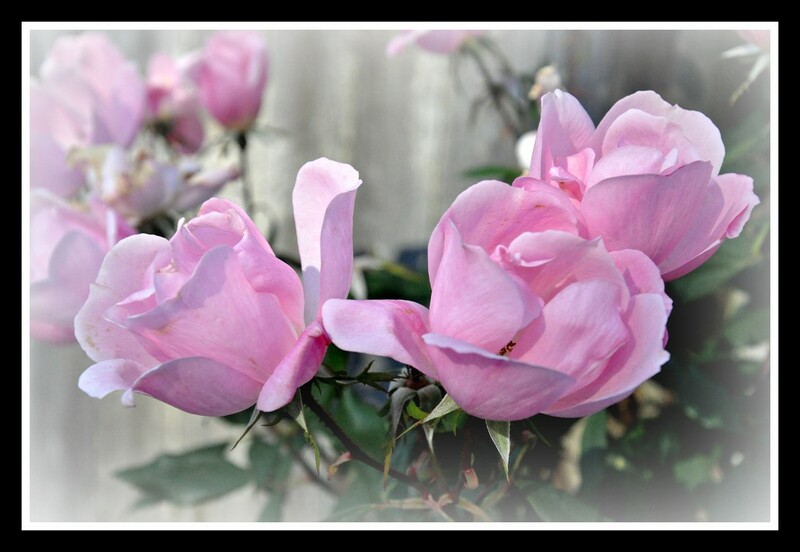 Beautiful roses and lovely editing. Fabulous - it could be July! Ours did till two weeks ago. Beautiful capture of yours and a nice processing and framing on the pic. Lovely focus Of the petals. Pretty pink against the grey. Fav - these are indeed beautiful roses and you've captured them beautifully too - you can almost feel the softness - and smell them, this side of 'the pond'!